Welcome to Tippecanoe Small Boats ltd. where you can expect the same level of excellent design, fine materials and clear instructions as you have become used to with model boats from Tippecanoe Boats ltd. Tippecanoe Small Boats ltd. is a spin off from Tippecanoe Boats ltd. and specializes in small human powered boats, kayaks and other small craft. These boats are designed with all of the know-how of integrating high strength carbon fiber and aramid fibers into epoxy and wood construction that has been developed in producing very light, strong model boats. Will Lesh is the designer for over 70,000 model boats that have been produced by Tippecanoe Boats ltd. His experience in working with light, powerful engineered composite construction has blended with his lifetime of sailing and building experience along with advanced mathematics and physics in his studies at Princeton University. His early building experiences included a wood and canvas canoe when he was 11 years old built with his 12 year old sister, a fiberglass white water kayak when he was 15, a rebuilt 19 foot Hurricane cold molded sailing sloop when he was 18, and a 24 foot ferro cement sloop when he was 24. He has owned the 24 foot ferro cement sloop, a laminated Western Red Cedar veneer 24 foot sloop which he built and sailed across the Atlantic, a 34 foot fiberglass sloop, and a 37 foot steel cruising sloop. The last three of these boats he still owns and sails. His familiarity with all of these boatbuilding materials and methods has contributed hugely to his understanding of what makes a superlative craft. Will's paddling began in his father's classic Thompson wood and canvas canoe on Lake Tippecanoe in Indiana. At age 15 Will built his first fiberglass whitewater kayak in his back yard. Throughout high school will paddled whitewater regularly with his classmate Jamie McEwan in rapids on the Potomac River below Great Falls, upstream from Washington DC. Jamie went on to win the Bronze metal in the closed canoe white water category at the 1972 Olympics in the whitewater slalom event. 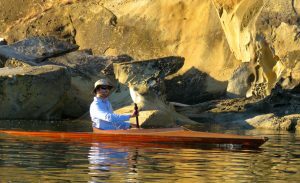 Paddling has been a lifelong love for Will and has been a great source of pleasure for Will ever since he moved to the Pacific Northwest. 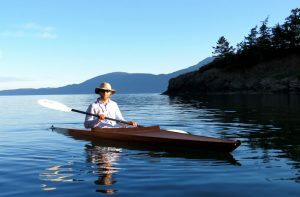 With all of the beautiful lakes around Everson and Bellingham and with Puget Sound and the islands beckoning, Will wanted a flat water boat that would be swift and easy to paddle and ultra-light for carrying and transporting - and that would have the beauty of wood. "I wanted a boat for myself that was so light that I could carry it for a mile, a boat that would be a featherweight joy to paddle and would be super easy to load by myself onto a car. Nobody made such a boat so I designed Swift Arrow and Silver Arrow for myself. 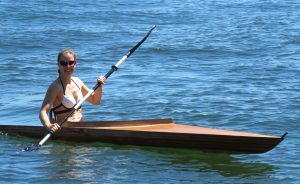 I paddle these boats more frequently than any of my other three kayaks or two canoes because they are so much fun to paddle being so lightweight and so easy to transport and launch!" Surely, " There is nothing, absolutely nothing half so much worth doing as messing about in boats, as Ratty soliloquized to Mole. Yes! You can build your own beautiful ultralight kayak. What a great experience to build something so beautiful and then to paddle the very boat that you built! Prepare yourself for all the wonderful comments you will get from strangers admiring your boat! Embrace your own creativity! Play.